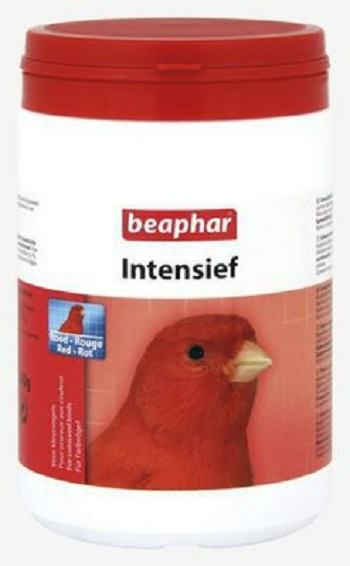 Bogena Red Intensive red colorant is a water-soluble powder, which promotes red color in feathers. Bogena contains natural vegetable colorants, provitamin A, which turns into vitamin A in the body, vitamin B2, C, and carotene pigment. Bogena Red Intensive may be added to the drinking water by dissolving 10g in 1 liter (quart) of warm water (2g = 1 teaspoon). Bogena Red Intensive may be added to egg/soft food. As a general rule the manufacturer suggest a mixture of 10g of Intensief with 1kg ( ) of egg/soft food. Give fresh twice a day, during the molt and during breeding. Results will only be obtained by feeding Bogena Red Intensive during the molting season, starting at least one week before the molt.